The app is available on both iOS and Android. To learn more simply click here. I can't log into the app? Hmmm tricky! Did you signup using Facebook one touch login? Make sure you use the same login as you did on your computer. If all else fails, reset your password! Click this link to reset now. Pull the screen down to refresh the screen. This should rectify the issue. Why can't I log steps for 30 September? Not to fear! We've all done it. Got a little too excited and entered things twice ;) Simply head to My Journey at the bottom of the screen and it will show you all your steps logged. Simply swipe right and the red box to delete will appear. I know I entered my steps twice but can't find them on My Journey? None of this is helping! Looks like it might be time for you to update your app. Head to your phone app store or google store and find the app. Update it and hopefully this resolve any bugs you're experiencing. If this still doesn't work just drop us an email and let us know. I've registered but I am having trouble logging in? Did you use your Facebook account to register? If you did, you will need to click on the 'Login with Facebook' button. If you are certain you used a particular username and password during registration but can't remember what password you chose, click on ‘Forgot Password’ on the login page. You’ll be prompted to fill out your registered email address. An email will then to be sent to you with a link to a page on the website where you can set a new password. Don't forget - if you used your Facebook, resetting your password won't answer your problems. Please make sure your computer isn't logged into someone else's Facebook account when trying to login to Steptember! I want to add an activity. How do I do it? To start, get four people together and choose a team leader who will register the team via the website. During the registration process, the Team Leader will be required to enter the names and email addresses of each Team Member. Each Team Member will then receive an invitation from the Steptember website to join the team and complete their personal registration. Make sure each Team Member has a unique email address during this process! I have more than 3 friends who want to join my team - how can we fundraise together? A Team Leader is the person who is in charge of registering your team. They will register your team on the website and can manage the admin for the team. Your team leader will be prompted to invite you during the registration process, so hold tight and wait for your invite to land in your inbox. You will then need to click on the link provided and complete your details. Firstly, set a target for your team. Remember this is your chance to change the lives of children and adults living with cerebral palsy. You will be surprised how easy it is once you get started. Who will be my sponsors? Friends, family members, employers, work colleagues, you name it. Anyone with a big heart! The biggest fundraising mistake people make is not asking. Think about how great you feel about making a difference, so why not give the people around you the same opportunity to help. How you raise funds is completely up to you, so get creative! Once you’ve set your team fundraising target, get the team together and brainstorm. You automatically get your very own fundraising page where anyone can make a tax-deductible donation. Have some fun and inject your personality and style into it! Your sponsors will not only be supporting Cerebral Palsy Alliance, they’ll be supporting you as well. Do I have to fundraise as a team or can I do my own activities? That’s up to you. All funds raised by you and your team members will be combined to reach your team target. How do I set a new fundraising target? Your Team Leader can change the team fundraising target on the My Team page. Simply head to the top right drop down menu after logging in and you will see the My Team option. Our team has reached our fundraising target, what happens now? Awesome! You obviously have a talent for it so keep going! Your Team Leader can increase your team’s target at any time on the My Team page. What can our team choose to fundraise for? You can select to fundraise for either research or services and equipment. If you’re unsure, Cerebral Palsy Alliance will allocate the funds to where they’re needed the most. If my sponsor makes a donation to my team through the website, will they receive a tax receipt? Yes. If the donation is $2 or more, a tax receipt will be sent to their nominated email address immediately. Make sure your sponsors check their junk mail for their tax receipt. What do offline donations mean? An offline donation is any funds not raised via the website. If you receive cash or a cheque from a donor, it is considered an offline donation. How do I add my offline donations to my online total? Use the banking and receipting area on your Materials page to bank your funds. Once funds are received by Cerebral Palsy Alliance, your fundraising total will be automatically updated. You can find the Materials section by logging into your dashboard and clicking on the Menu button in the top left of the screen. How does my sponsor receive a receipt for offline donations? When you bank the offline donation, you’ll be prompted to enter the donor’s details. Once the funds are received by Cerebral Palsy Alliance, your donor will be sent a receipt via email. On the Materials page, you’ll find a receipt template to record your donor’s details and donation amount. This is useful for recalling the details when entering them into the site. What is a tax-deductible donation? A tax deductible donation is any donation over $2 that was not given in exchange for goods or services. Do I have to wait for Steptember to start before I can start fundraising? No, you can start fundraising as soon as you register. The sooner, the better! Is the Steptember website secure? Yes. The Steptember website uses SSL technology to encrypt your personal data when it is transferred from your browser to the website. Your personal details are protected on our servers, which are PCI DSS (Payment Card Industry Data Security Standard) compliant. We never store any credit card details on our servers. What else can our organisation do to make Steptember even better for our staff? When do I wear my pedometer? All the time! Only take your pedometer off when you're going to bed or in any type of water (as your pedometer isn't waterproof). We also advise that you remove your pedometer when taking part in any activity that can be converted into steps on the website, for example cycling, yoga, etc. (see other activities below). I do other physical activities apart from walking, for example cycling. Can this count towards my step total? Yes! Steptember isn’t just about walking. We encourage you to get out and do any activity you enjoy. We’ve created an activity conversion table to convert over 40 activities into steps. Simply select this activity when you record your steps on your web page. I can’t see my activity on the conversion table — does that mean it doesn’t count? Not necessarily. We’ve done our best to convert as many activities as we can, but it's impossible to include everything - ‘Curling’ for example or ‘Finnish Wife Carrying’! If your activity isn’t represented, try to select an activity that is similar to it. Please feel free to email one of our friendly Steptember team members and we’ll try and have your activity added to next year’s list. Can I buy an extra pedometer if I lose or break both of mine? If you need an extra pedometer, please contact the Steptember Team. Will I ever need to replace the battery in my pedometer? You shouldn’t need to replace the battery during Steptember. They are built to last the duration of the event. At some point in the future, however, the battery will run out. Simply follow the instructions supplied with your pedometer to change it. Do I have to enter my steps every day? We recommend that you enter steps every day to allow a steady journey up your virtual mountain. Can anyone else see my step entries? Yes, you should be proud of the steps you have taken. If your friends or family search for your team name, your steps will show. Can I only enter my steps via the Steptember website, or is there another way? You can also enter your steps via a smart phone or tablet. What are the other activities that can be converted into steps? You can read all about Steptember here. What are the start and end dates for Steptember? Steptember starts on Tuesday September 3rd, 2019 and ends at midnight on Monday September 30th, 2019. Registration will open in early April 2019! Register your interest now. When will I receive my Steptember Kit and what does it include? Steptember Kits will start landing on doorsteps in August, 2019. Please allow 10 working days after registering for your kit to arrive from Australia Post. Each kit includes a 3D pedometer, lanyard and Steptember booklet. Steptember kits will be sent to the postal address you enter during registration. Each team member will be sent their own pack. Can I register with an international address? 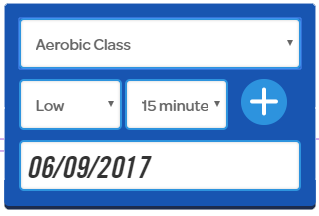 How much does it cost to join Steptember? When you register, you’ll receive a Steptember Kit which includes a good quality 3D pedometer to count your steps, a Steptember Handbook and exclusive access to the Steptember website. Registration is $25 per adult and $10 for kids. My organisation has pre-purchased teams, and one of my team members is a child, do we get a discount? Unfortunately no, all pre-purchased teams are at the fixed cost of $100 for four people, regardless of age. • You’ll have a great motivation to exercise more. You’ll get off the bus one stop early. You’ll take the stairs instead of the lift. You’ll dance in the supermarket (well, maybe). • Speaking of: you’ll have more energy. You’ll sleep better. You may even lose a few kilograms – that of course is all win-win! • You’ll set up some friendly competition in the office and challenge workmates (or as we call them: ‘arch enemies’) you know you can beat! • Best of all, you’ll feel great knowing that the money you raise is going to a fantastic cause. 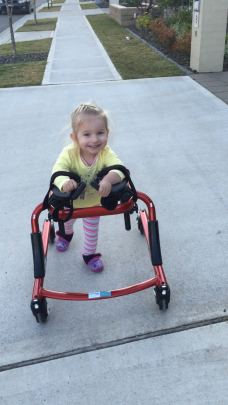 You’ll be helping kids like Sammy (pictured) with cerebral palsy get the specialised equipment she needs to do basic, everyday things we take for granted, like standing up or moving around.